This wrap is made of whole wheat and hence more nutritious and has high fiber. Vegetables are vitamins and minerals packed and further add fiber to the wrap and thus aids in digestion. Paneer is high .. This is a low calorie Greek Cuisine. It is not only delicious but also has great health benefits. Brown rice adds fiber to the dish and it helps digestion. 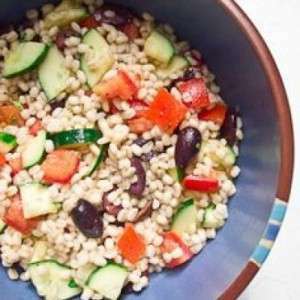 Also it is more nutritious than the white ri..
Chickpeas cauliflower salad is a typical Greek cuisine which provides great nutritional benefits as well as satiety and fullness even when you want to lose weight as it is low in calorie. Cauliflower .. Egg is a rich and inexpensive source of high quality protein and more than half the protein is found in the egg white. Also egg white has lower fat and cholesterol than the yolk. Egg does not have car.. Fish cooked in a low fat curry is very ideal for weight loss and has many nutritional benefits. Fish regulates cholesterol and improves heart health. It also treats insomnia and improves respiratory h.. This pulav made with barley is no low in calorie and have many nutritional benfits. Barley is heart healthy and it helps manage blood pressure. It a rich source of manganese and selenium. It also prom..
Paneer is high on protein and calcium and it is not only delicious but also keeps you full for long time and is great for weight loss. It maintains blood sugar level and it is good for heart. It .. This khichdi is made with soyabean which is a very good source of protein, B vitamins and minerals.and an excellent source of iron and calcium. The white rice is replaced with brown rice which has mos..
Toor dal is good plant source of proteins and it contains folate which is good for women planning for pregnancy as it helps reduce certain brain and spinal cord birth defects. It also helps maintain b..